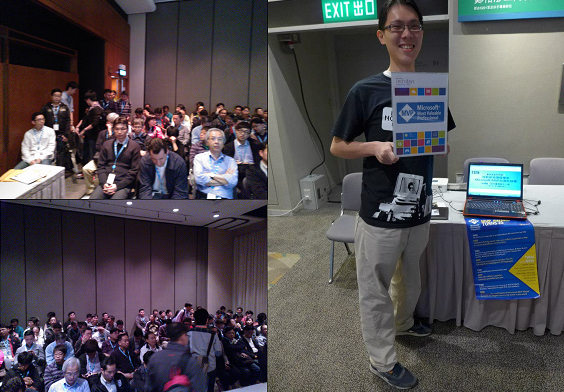 This year, The TechDays Hong Kong 2013 was themed as a Mega 3-day seminar, focusing on Building your skills and knowledge with Microsoft technologies. A total of 136 technical breakout sessions and Hands-On-Labs ranging from Level 100 (Introductory) to Level 300 (Advanced), were all delivered by 42 highly recognized speakers in the industry. The main highlights of the event covered the latest of Microsoft technologies, products, solutions and services. This includes Office 2013, Windows 8, Windows Server 2012, Microsoft SQL Server 2012 and Microsoft System Center 2012. Our Malaysia Developer Security MVP Walter Wong is honored to be among the experts to deliver not just one by four technical sessions, to an overall audience of 480 attendees! MVP Walter done us proud being the only SEA MVPs speaker at this highly attended event in HK!